California Gov. 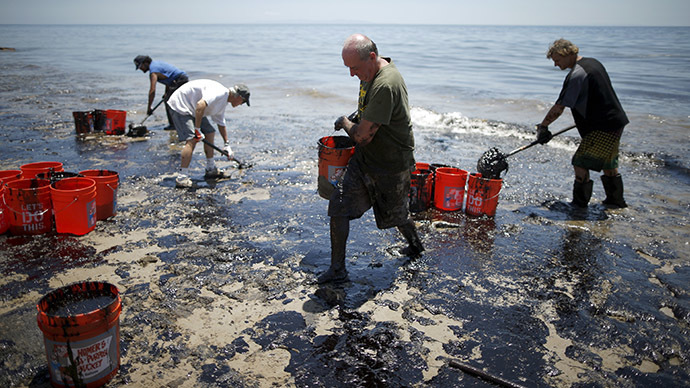 Jerry Brown declared a state of emergency over Tuesday's oil spill off the Santa Barbara County coast. It follows news that up to 105,000 gallons of oil leaked out from the ruptured pipeline. Brown's office added that six boom boats, three 65-foot collection vessels and hand crews coordinating with the state as clean-up efforts continue. California state oil spill, wildlife and emergency officials are also working to alleviate the situation. Originally, US Coast Guard officials estimated that the approximately 21,000 gallons of oil had spilled out of a pipeline operated by Plains All American Pipeline, though this calculation is being investigated. The type of oil was later identified as crude, and officials said the spill had stretched out to approximately nine miles across Santa Barbara County's Refugio Beach. The company stated to AP that the 105,000 gallon estimate was a"worst-case scenario"and that it does not know exactly how much oil actually seeped into the ocean. The pipeline itself is onshore, but oil traveled down a storm drain before hitting the Pacific Ocean. Refugio Beach was closed after the oil spill occurred, as was neighboring El Capitan State Beach. According to the Los Angeles Times, this particular pipeline was constructed in 1991 and had never leaked before this week, company officials said. It is capable of carrying roughly 150,000 barrels every day. Darren Palmer of Plans All American Pipeline told the newspaper that the company conducted an integrity check on the pipeline two weeks ago but had yet to learn the results. So far, there has been no official reports of wildlife being harmed by the spill, but officials said it could affect the environment since oil did seep into the water. Local fisheries that have been affected by the spill have also been shut down for the time being, Brown's office stated. Linda Krop of the Environmental Defense Center told the LA Times that the Santa Barbara Channel is "one of the most biologically rich places on the planet" and that multiple species of animals could be affected, including migrating whales and seabirds.